We are happy to announce our brand new bar menu for our Irvine (Los Olivos) Location. 4:00 PM — 6:30 PM. Come down to our new, beautiful Los Olivos location for happy hour, every night from 4pm – 6:30pm. 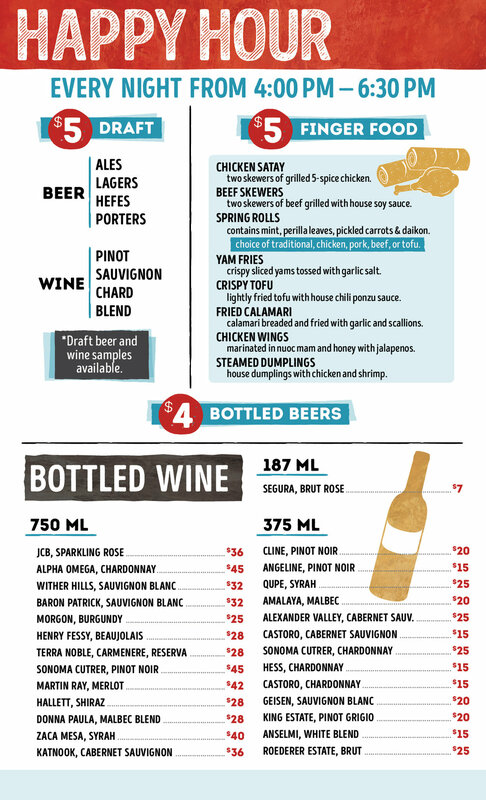 Finger Food for $5, Bottled Beer for $5 and Draft for $6. There is no better way to spend your night. We at PHANS55 are happy to invite you to our grand opening (august 13th, 1pm - 7pm) of our new location in the Los Olivos Marketplace in Irvine, CA! There will be complimentary samplings of tantalizing Vietnamese cuisine (1pm - 3pm and again at 5pm - 7pm), and complimentary samplings of boutique wines, beers and Sangrias pairing with Phans55 cuisine (1pm - 3pm and again at 5pm - 7pm). Stay and share in the luv with raffle & prize drawings, happy hour menu all day, 20% OFF on all bottled wines and DJ music (4pm - 7pm)! Come on down, enjoy the fun and see what we are all about.